Bear Cub Playdate is a 500 piece jigsaw puzzle designed by artist Jack Williams. Bear cubs frolic in the flowers with their forest playmates. 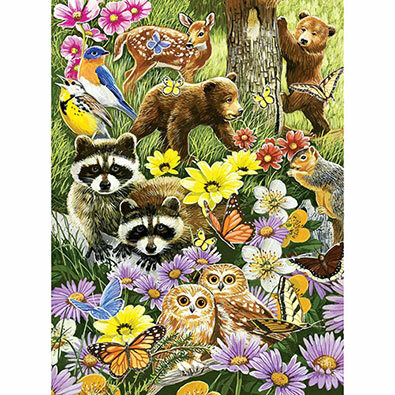 Raccoons, owls, birds, butterflies and a fawn fill this playful scene. Available in two-piece counts. • This forest animal puzzle is a great gift for those who like nature and wildlife. This 500-piece jigsaw is designed by Gloria West and measures 46 cm x 61 cm. Horses race on a trail of clouds through the path of a dream catcher. Available in two-piece counts. This 500-piece jigsaw is designed by Mary Thompson and measures 46 cm x 61 cm. Farm animals have gathered around the small watering hole in the center of the farm to drink from or, in a few cases, bathe. Available in two-piece counts. This 500-piece jigsaw is designed by Parker Fulton and measures 45 cm x 24 This puzzle depicts a traditional Japanese tea room. Swans bath in the pond out the window. Available in two-piece counts. Love Is In The Air is a 500 piece jigsaw puzzle designed by artist Abraham Hunter. A buck and doe kiss among wildflowers in the forest. The orange and reds of changing leaves on the trees fill the colourful background. Available in two-piece counts. The Land Of Fantasy is a 500 piece jigsaw puzzle designed by artist Gerald Newton. A unicorn visits with a family of bunnies in a flower filled field by a stream. A vibrant rainbow and magnificent sunrise appear above a medieval castle in the background. Available in two-piece counts.